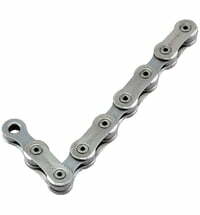 Chains made in Germany - quality you can feel. Wippermann was founded in 1893 by Wilhelm Wippermann and initially produced bicycle and motorbike components. It was successful right from the start, expanded rapidly before the First World War, and soon had several production plants in Germany and abroad. However, the company soon had to face setbacks: due to the Second World War almost all plants were destroyed. As early as in 1929 Wilhelm Wippermann jr. had taken over the management of the company after his father’s death and managed to consolidate the company and to create a new foundation. In the nineties, the traditional business in Hagen finally managed to become an international company. Today, Wippermann is a successful family enterprise in its fifth generation. Owing to continuous investments in state-of-the-art technologies, Wippermann is able to guarantee production processes on the highest level. Furthermore, it is always aiming at improving environmental protection as well as the health of all employees by appropriate investments. The famous quality is ensured by the use of selected raw materials, by high competence in processing semi-finished goods as well as by the application of heat treatment and coating procedures. Wippermann's comprehensive distribution network with subsidiaries, agents and dealers as well as sales representatives guarantees the availability of the products everywhere in the world – fast and reliably.